Tooth cavities in dogs were once thought not to develop. We are diagnosing tooth decay and cavities with an increasing frequency in dogs. With routine oral exams and the routine use of dental radiographs in veterinary practice, the diagnosis of tooth cavities is clearly increasing. The earlier these lesions are diagnosed, the greater our ability to save, rather than extract these teeth. Early cavities involve damage to tooth enamel and dentin. Longer term tooth decay results in pulp inflammation, infection, discoloration and death of the tooth. These teeth must be treated by root canal therapy or by dental extraction. Some teeth fracture due to extensive tooth destruction. The problem may progress to facial swellings or dental tract formation. Carious lesions are most frequently identified on the occlusal (biting or chewing) surfaces of molar teeth in dogs. Early lesions are diagnosed by observation and investigation of discolored areas of teeth. Soft enamel may be detected using an explorer probe. These lesions progress into the dentin. The dentin is "demineralized" by the decay process. Dental radiographs confirm the presence and extent of these lesions. Early tooth decay is detected with the explorer probe as soft enamel and dentin. It is essential to take and evaluate dental radiographs before deciding to treat, or to extract these teeth. We need to make certain that the tooth remains vital (alive) if we intend to restore them. If the tooth is non-vital, it may be treated by root canal therapy and then with a restoration. Carious lesions may be restored by performing "cavity preparation" and the placement of amalgum or composite restorations (fillings). We no longer use amalgum for tooth restoration in our practice due to complications associated with bacterial leakage, tooth weakening and discoloration. Clinical photos of carious lesions in dogs. Right upper first and second molars. Composite restoration has been performed. The original anatomy is carefully recreated. on both sides, as in this case. Cavity preparation and restoration illustrated step by step! Explorer probe "sticks into the tooth". lesion resembles the probing of leather. A dental currette is used to excavate The decayed tissue appears brown. penetration of the pulp tissues. of debris circumferentially. of the preparation with "near pulp exposure". rinsed, the bonding agent is applied. layers. Each layer is light cured. The final restoration is covered by four layers of "light cured" bonding agent. dogs they are on the upper and lower dental arches. This sheltie had oral pain. Dental sensitivity was on both sides. had the same two lesions in the same cavity that entered the pulp chamber. Lower molars with cavities can be difficult to treat. important, or dental extraction may be the only treatment option. Severe tooth decay is best treated by dental extraction. 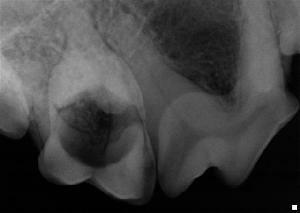 The structural weakening of these decayed teeth (see radiograph below) commonly leads to tooth fracture. Restoring weak teeth serves no useful purpose and is discouraged. extensive destruction of this cavity.